Annual Alumni dinner was hosted by JIMS sec-5 for their BBA & BCA students. 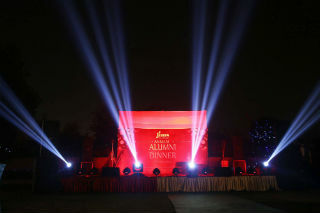 The purpose for this alumni dinner was to create a platform where the alumni and institute could reunite to share their feelings with each other. 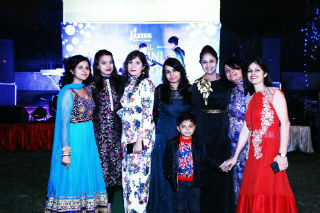 The evening witnessed a gala participation from both sides. The students thanked the college, faculty and the non- teaching staff for their constant guidance, support and enriched journey at JIMS. This also gave an opportunity to the alumni to give back to their alma mater. Hugs, smiles, pats, clicks & music were in the air. The back lawn area looked beautiful decorated with lights, pin boards, posters &flex all in shades of blue and whites. The batch of juniors was busy working out minute details till the last minute & finally alumni started walking in. The chirpy , naughty, smart boys and girls looked like prepared and learned bunch of men and women looking forward to a special nostalgic evening. The event kick started with a band performance by JIVITVA - “which means celebrating life.” Jivitva – The Rock Band is all about making medleys,songs that touch the heart and soul of the audience. In Short, ‘THEY PLAY WHAT THEIR AUDIENCE LOVES TO HEAR. This was followed by dance performance by students of JIMS Dance society which was much appreciated by the audience. The vigor amongst the audience set the event rolling. 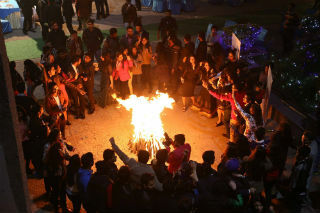 A simultaneous bonfire kept the warmth alive. Selfies and clicks were omnipresent. The fun continued with the Punjabi “Dhol” onto which everybody frolicked. A concurrent photo booth was also set up with props for the alumni and faculty members to get their memories framed. 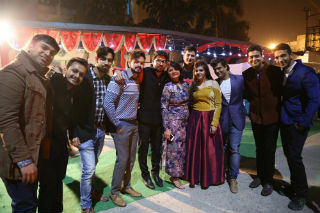 As the evening grew old it saw many phases – a sense of familiarity & nostalgia, a sense of celebration & fun and a feeling of emotional connect with the alumni. Towards the end the students put their dancing shoes and grooved. Students were loving the DJ but as George Bernard Shaw said ' There is no sincerer love than the love of food' & thus they relished a lavish buffet after a tiring dance session. Whatever starts has to come to an end and so did this beautiful evening.The back lawn area looked spectacularly lit by moonlight and the building of JIMS stood tall like a proud parent ready to reunite.